Try our amazing Downtown Experience Package and see just about all of lower Manhattan! You get 24-hour access to the Hop-On Hop-off Downtown Tour and ferry as well as entrance to One World Observatory and the 9/11 Tribute Center. The Downtown Experience Packages gives you with access all of the major highlights in lower Manhattan! The Downtown Hop-On Hop-Off buses take you around the area and allows you to hop off and explore further whenever you'd like. From the Hop-On Hop-Off ferry, you can admire lower Manhattan from the sea. The package also includes entrance to One World Observatory, where you can admire all of New York City the tallest building in the Western Hemisphere and the moving 9/11 Tribute Center, where you can hear personal stories from those affected by the terrible events. Shortly after your booking is complete your e-ticket will be sent directly to your email, just print it out and exchange it at the Gray Line CitySightseeing New York Visitor Center. Please go to the Gray Line CitySightseeing New York Visitor Center to exchange your e-ticket for your original tickets. Once you have exchanged your e-tickets your Hop-On Hop-Off bus and ferry passes are valid for 24 hours. The One World Observatory and 9/11 Tribute Center tickets are valid for 30 days. Yes, children's tickets are available for children between age 3-11. Children under the age of 3 years are free when accompanied by a paying adult. 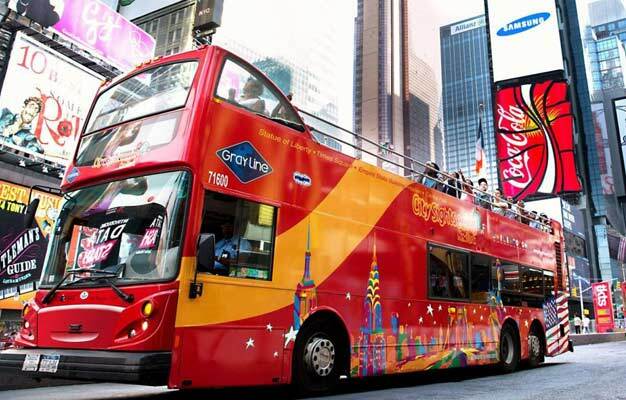 Gray Line CitySightseeing New York Visitors Center is open daily 9 AM-5 PM.